Has your housekeeping moved into the 21st century? 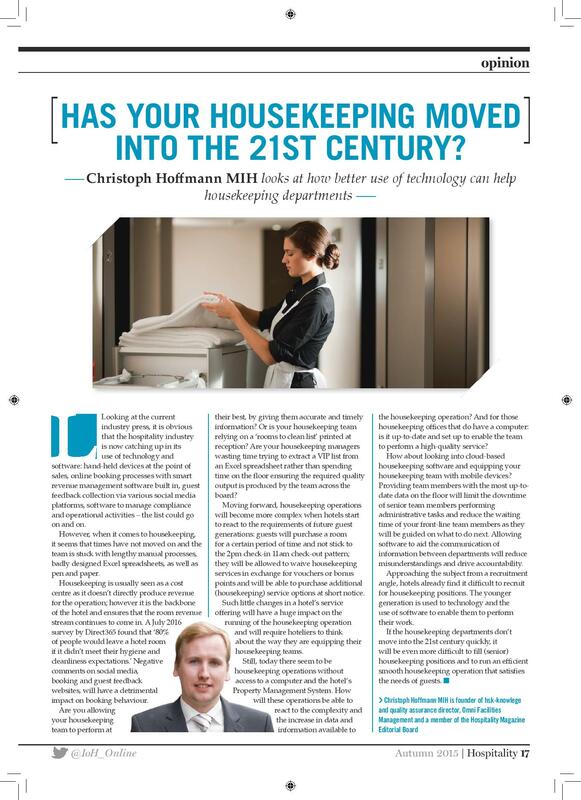 Christoph Hoffmann MIH looks at how better use of technology can help housekeeping departments. Looking at the current industry press, it is obvious that the hospitality industry is now catching up in its use of technology and software: hand-held devices at the point of sales, online booking processes with smart revenue management software built in, guest feedback collection via various social media platforms, software to manage compliance and operational activities – the list could go on and on. However, when it comes to housekeeping, it seems that times have not moved on and the team is stuck with lengthy manual processes, badly designed Excel spreadsheets, as well as pen and paper. Housekeeping is usually seen as a cost centre as it doesn’t directly produce revenue for the operation; however it is the backbone of the hotel and ensures that the room revenue stream continues to come in. A July 2016 survey by Direct365 found that ‘80% of people would leave a hotel room if it didn’t meet their hygiene and cleanliness expectations.’ Negative comments on social media, booking and guest feedback websites, will have a detrimental impact on booking behaviour. Are you allowing your housekeeping team to perform at their best, by giving them accurate and timely information? Or is your housekeeping team relying on a ‘rooms to clean list’ printed at reception? Are your housekeeping managers wasting time trying to extract a VIP list from an Excel spreadsheet rather than spending time on the floor ensuring the required quality output is produced by the team across the board? Moving forward, housekeeping operations will become more complex when hotels start to react to the requirements of future guest generations: guests will purchase a room for a certain period of time and not stick to the 2pm check-in 11am check-out pattern; they will be allowed to waive housekeeping services in exchange for vouchers or bonus points and will be able to purchase additional (housekeeping) service options at short notice. Such little changes in a hotel’s service offering will have a huge impact on the running of the housekeeping operation and will require hoteliers to think about the way they are equipping their housekeeping teams. information available to housekeeping operation? And for those housekeeping offices that do have a computer: is it up-to-date and set up to enable the team to perform a high-quality service? How about looking into cloud-based housekeeping software and equipping your housekeeping team with mobile devices? Providing team members with the most up-todate data on the floor will limit the downtime of senior team members performing administrative tasks and reduce the waiting time of your front-line team members as they will be guided on what to do next. Allowing software to aid the communication of information between departments will reduce misunderstandings and drive accountability. Approaching the subject from a recruitment angle, hotels already find it difficult to recruit for housekeeping positions. The younger generation is used to technology and the use of software to enable them to perform their work. If the housekeeping departments don’t move into the 21st century quickly, it will be even more difficult to fill (senior) housekeeping positions and to run an efficient smooth housekeeping operation that satisfies the needs of guests.